.......53 Buddhas and Me .................My Life Adventures.....: "I Love Totem Poles"
traveled to Vancouver Island. One of the little towns we visited was "Duncan - The Town of Totems". I was in heaven, I couldn't move fast enough to take enough photos. I was like a kid in a candy store. 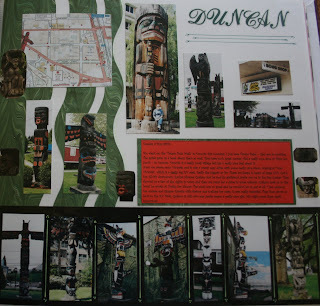 The photos I have included here are one the scrapbooking page I did on Duncan and the other is Rachel sitting on a huge Totem Pole - from my memory I think it is the "Biggest Totem Pole in North America". I really enjoy learning the meaning of each part of the Totem and the detail carved is amazing. When standing in front of them I can feel their amazing aura. Yes, I do LOVE Totem Poles!!! I did find you and I too love totem poles although I never have been quite as excited about them as you are, we have totem poles all over our beautiful country and I suppose that I am used to seeing them! I will use your idea, if you don't mind, and post a totem pole one day as my picture of the day.